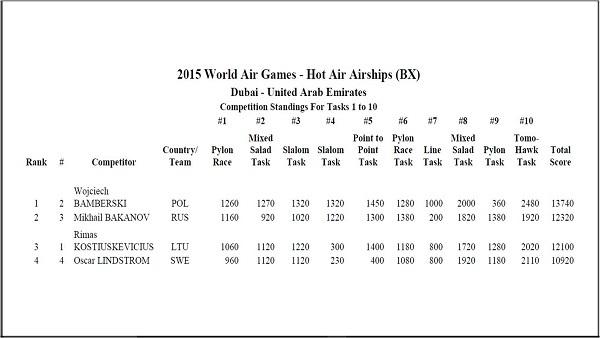 There are only four of these specialized aircraft competing, and you have to be up early to catch them. Lithuania, Russia, Poland and Sweden are all taking part. 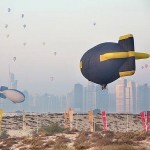 Two hot air airships in flight. 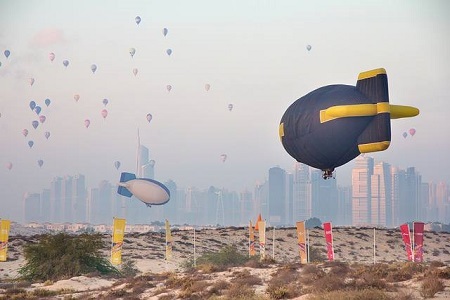 In the background the Dubai skyline and a large number of hot air balloons participating in other competitions of the World Air Games. 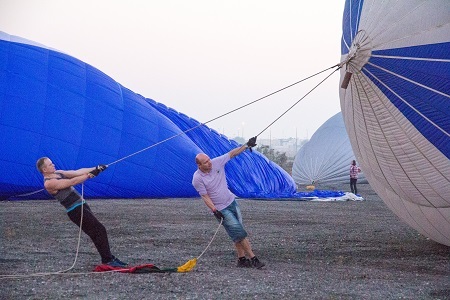 An airship is held by the ground crew as the air is heated to achieve buoyancy. 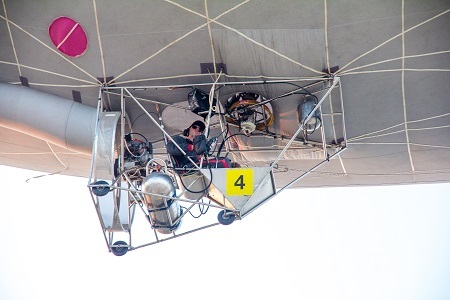 The pilot sits in a cart suspended below the hot airship. 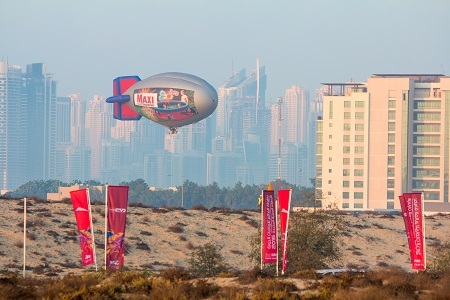 Behind us, almost 50 hot air balloons float silently over the city skyline on an early morning training flight. In front of us, the airships are slowly pushing forwards, nose down, sometimes no more than three meters from the ground. 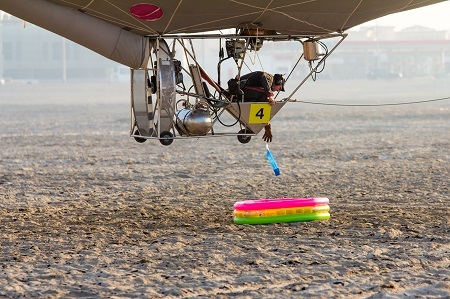 Pilots have to navigate through a pair of inflated pylon start gates, then have four minutes to complete four tasks. Dropping a marker on a specified target. 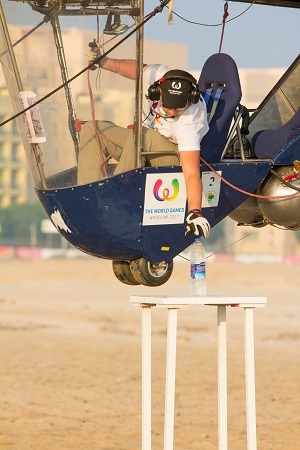 Some tasks are performed at less than 3 meters above the ground. A bottle is picked up from one table and then placed on another table. 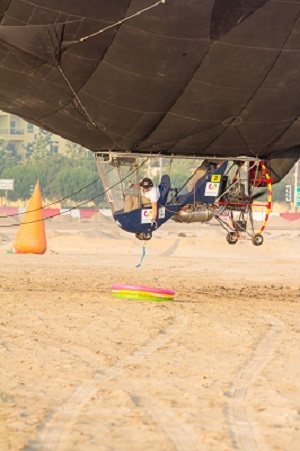 Polish pilot Wojciech Bamberski received the coveted gold medal for the hot air airships competition at the FAI World Air Games earlier this evening (December 6). Left to right: Russian pilot Mikhail Bakanov (silver medal), Polish pilot Wojciech Bamberski (gold medal and Lithuanian Rimas Kostiuskevicius (bronze medal). Mikhail Bakanov from Russia finished in silver position, and the bronze medal made a fabulous birthday present for Lithuanian Rimas Kostiuskevicius. This entry was posted in Airships, Championships, Hot Air Airships and tagged airship, Dubai, FAI, Fédération Aéronautique Internationale, Hot Air Airship, Hot air balloons, World Air Games. Bookmark the permalink.